Using Shopify's fulfillment and shipping options, you can set dStudio as a third-party fulfillment partner, you'll need a unique dStudiouk.email address first, contact us to request your email address before you continue this integration. 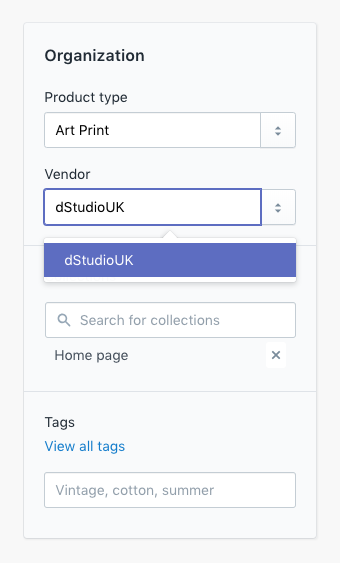 If you've already got your unique dstudiouk.email address, you're ready to start, log in to your Shopify account and find the Shipping options within Settings. Once set up, head over to Notifications to customise the email template we'll receive for each order placed. You can either follow the instructions below, or use our Shopify Template Creator to select your print specifications. Copy the line below and paste it into your Shopify template. Copy the text below and paste it into your Shopify template, replace the parts in CAPITALS with your own specific details, more help with this below. Special Instructions can be used if your customer wishes to include a gift message for example, or if you need to pass on any information to us when fulfilling the order. If you require different specifications - like paper type or finishing - with different products within your store, the paper type must form part of your product title or product variant and should not feature in this part of the template. Please contact us if you need any help setting up your template. If you need dispatch notes or invoices to be included within your delivery, we recommend using Order Printer Emailer, this allows the creation of a PDF and a link to download it, which can then be inserted into your template. When following the set up steps in Order Printer Emailer, you'll be provided with a URL, use this in the following code block, which should be inserted within or at the end of the email notification template. Order Printer Emailer will give you a line of html with a link included, you'll need everything within the '' after the href= to replace the link above inside the brackets (). The final setting is applied to each of the products you sell on your Shopify store that you would like us to fulfill, from the Products menu item, simply edit a product and change the Vendor setting to dStudio from the select menu. Remember to click Save to update the changes to your product once you've changed the Vendor setting. To use this integration, you will need to send or sync your images so that we have access to them as soon as your first order arrives. You can either send us your images to store offline, we recommend a transfer via www.wetransfer.com for this. If you would rather have a synced folder with us - so you can update and add to your images - we use both Dropbox and Google Drive, set up a folder to only include the images we need and send us an invitation to share the folder with you.